NSFA, Panacan, Davao City - Two hundred seventeen Former Rebels were awarded the Comprehensive Local Integration Program (CLIP) cash assistance during the Regional Peace and Order Council Meeting at Agusan Sur Provincial Capitol Nalyagan, Pati-ay, Agusan del Sur on October 12, 2018. 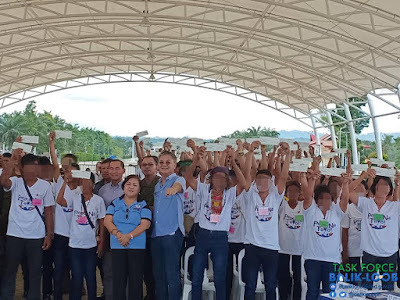 The awardees who are from Agusan del Sur were recommended to receive cash assistance by the CLIP Committee of the different Provinces of the Region and properly endorsed by the Regional Director of Department of Interior Local Government Region XIII to Task Force Balik Loob for their enrolment in the Enhanced CLIP. In their enrolment to the E-CLIP the FRs will be given free skills training in Technical Education and Skills Development Authority (TESDA) and Department of Labor and Employment (DOLE) Livelihood Program, other interventions may include PhilHealth enrolment, housing, legal assistance and other social intervention from DSWD and OPAPP which will be determined during their needs assessment interview. The E-CLIP which is being implemented under the Task Force "Balik Loob," headed by Undersecretary Reynaldo Mapagu of the Department of National Defense, is an offshoot of the Administrative Order Number 10 signed by President Rodrigo Duterte on April 10, 2018, converging the Comprehensive Localized Integration Program of DILG and programs of interventions of different government agencies to former rebels to prepare them to be integrated into mainstream society. The awarding ceremony was graced by USec. Mapagu as head of Task Force Balik Loob, DILG Regional and Provincial Directors, Military Commanders in the area, different Provincial Governors of CARAGA led by Hon Gov. Angel Mataba, the concurrent RPOC XIII Chairman.